As an incoming freshman, I would hope you already know about Wisconsin’s horrendous winters, headlined by dangerously cold temperatures and varying amounts of snow. It can ultimately lead to a winter inside, but who wants to spend their entire winter break indoors? If you’re going to be stuck in Wisconsin winter’s for the next couple of years, you might as well take the opportunity to ditch the frigid weather for some more enjoyable winter temperatures and activities, while still enjoying what makes this break amazing, WINTER! Head West during your winter break and go to Squaw Valley Ski Resort in Olympic Valley, California! Located in the Sierra Nevada mountain range, temperatures in the area average to about 30 degrees Fahrenheit in the winter, allowing for safe and enjoyable fun in the winter weather. Whereas skiing on local hills doesn’t allow for runs much longer than a mile, Squaw Valley’s longest run is almost 3 and a half miles long! And with almost 300 different skiing and snowboarding trails, you’ll have endless fun in 40+anuall inches of snow and the newer addition of night skiing is now available for most runs so the fun can last all day! The storied history of this ski resort is exemplified by its hosting of the 1960 Winter Olympics. With the only ‘funitel’ (a special kind of ski lift) in the U.S., the mountain has much to offer you in the winter, far from the flat, desolate landscape of Wisconsin. If you’re not one to hit the slopes, there’s various restaurants, a pool, shopping center, and roller skating at Squaw Valley’s ‘high camp’, accessible by the 2,000 ft. high aerial tramway that takes visitors to the upper part of the mountain and resort. 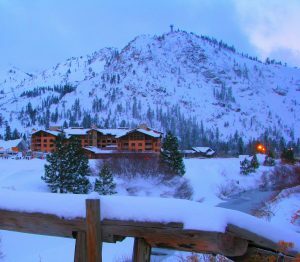 So pack your bags, ditch the Midwest, and travel to a comfortable snowy winter at Squaw Valley Ski Resort!